On February 11 Russian and Japanese foreign ministers Sergei Lavrov and Seiji Maehara met in Moscow for two hours, one-on-one for half of that time. Maehara is an advocate of revising Article 9 of his nation’s constitution (which states “the Japanese people forever renounce war”) and of securing the Kurils’ early return from Russia, which seized them in the waning days of the Second World War. “During the rally in Tokyo on Monday [February 7], Maehara pledged that he would personally see to it that the islands are returned to Japan, in fact he staked his political career on the realization of this. “Maehara fundamentally believes two things: firstly, the islands are legally Japanese territory and secondly, that Japan cannot completely end World War II until the islands are returned and a peace treaty signed. Maehara rejected Lavrov’s suggestions for a historical commission to examine the issue of the contested islands and for turning the Kurils into a free trade zone, stating that Japan would consider the second proposition only if it did not “alter Japan’s legal position” on what it calls its Northern Territories. The Japanese foreign minister was conspicuously not invited to meet with President Medvedev and Prime Minister Vladimir Putin. “Russia’s unresolved conflict with Japan over the Kuril Islands, which has been simmering since WWII, may reach a boiling point now that Russian authorities are set to go ahead with their plan to build up the disputed territory’s defense potential. 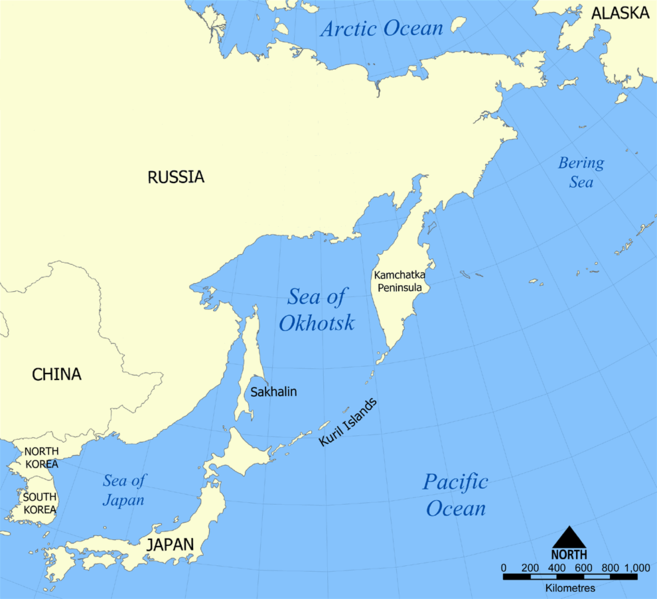 In the San Francisco Peace Treaty signed in 1951 to officially end World War Two, the U.S. recognized that Japan had lost any rights to reclaim the South Kurils as well as Sakhalin Island, although it did not recognize then-Soviet claims either. The treaty, to which the U.S. is one of 48 signatories, unequivocally states that “Japan renounces all right, title and claim to the Kuril islands, and to that portion of Sakhalin and the islands adjacent to it” acquired after the Russo-Japanese War. The current American position on the Kurils, then, is what it is in relation to the South Caucasus nations of Abkhazia and South Ossetia: That they are “Russian-occupied territories” belonging to other sovereign nations. Japan in the first case and Georgia in the other two. “This is not the first time that the US has tried to drive a wedge between Russia and Japan….In 1955-1956, the USSR and Japan held talks on a peace treaty which resulted in the adoption of a Soviet-Japanese declaration. This declaration envisaged the restoration of diplomatic ties and the end of military action but did not resolve the territorial issue. “The islands are located in a key geographic position where they secure the entrance into the Pacific Ocean for Russia’s Pacific Fleet. “If the four islands were regained by Japan and used as a natural barrier by Japan and the United States, Russia’s Pacific Fleet would be cut off from the Pacific and may face direct military threats from the two. “Analysts said a ‘butterfly effect’ could mean the neighbouring Kamchatka Peninsula and Sakhalin region, both strategic to Russia’s ability to respond to attacks, would also be exposed. “The Kurils are the gateway to the sea of Okhotsk, which lies off the coast of Russia’s far east. Control of the islands have been crucial for Russia, which has given it access to the Pacific Ocean. “Russia has built a military base on Shikotan island [in the South Kuril chain], while also placing border forces on the four islands. The U.S. is to spend $3.7 billion over the next five years to develop as many as 100 “new, stealthy, long-range, manned bomber[s] likely specifically intended to penetrate Chinese air defences.” The new warplane, as yet unnamed, is reported to be a long-range, nuclear-capable penetrating bomber with the option of being piloted remotely. The U.S. recently completed this year’s Cobra Gold military exercise in Thailand. “The participation of Indonesia, Japan, South Korea, Singapore and Malaysia makes the 30th annual joint exercise one of the world’s largest multilateral military maneuvers.” As a testament to the dramatic expansion of a U.S.-led Asia-Pacific NATO, the exercise also included observers from India, Sri Lanka, Laos, Brunei, Mongolia, the United Arab Emirates and New Zealand among others. This month Lieutenant General Patrick O’Reilly, director of the Pentagon’s Missile Defense Agency, said that “The United States plans to deploy the Standard Missile-3 Block IIA upgrade by 2018” in a letter to Nobushige Takamizawa, director general of policy at the Japanese Defense Ministry. 26) New US Bomber Aimed at China? this is mondial madness! (I live in France ) Is the US intent on making every country in the world either a NATO lackey or an enemy? Is it essential to spend every cent you can make on WMD and planes, ships, tanks to carry them, while your formerly great country falls in ruins of poor fools, jobless or in prison or working to make more weapons? Does it never occur to him that the provocation of the USA towards China and Russia makes them feel the need to up the ante. Who benefits? Who cares? ?